On 6th June 2009 Portsmouth held events to mark the 65th anniversary of D-Day. The day started with a parade from Lumps Fort to the D-Day stone on Southsea Seafront. The sound of bagpipes filled the air and more than 200 people crowded to hear the service lead by Canon Bob White from St Mary's Church. Wreaths were then laid to honour all the men who made the ultimate sacrifice. The Royal British Legion then held a huge 1940s style party on Castle Field and around the D-Day Museum to mark the anniversary of D-Day. Visitors were taken back in time to the 1940s and people were encouraged to dress up in 1940s style clothes. The D-Day Museum extended its opening hours and offered free entry to enable people to see the Overlord Embroidery and much more. Between the museum opening and 11:45 1,600 people had been through the doors of the D-Day Museum. There was period music, dancing and many exhibits. There was an RAF flypast and one million Poppies fell from the skies blanketing the seafront in a moving tribute to those who fought and died in France. 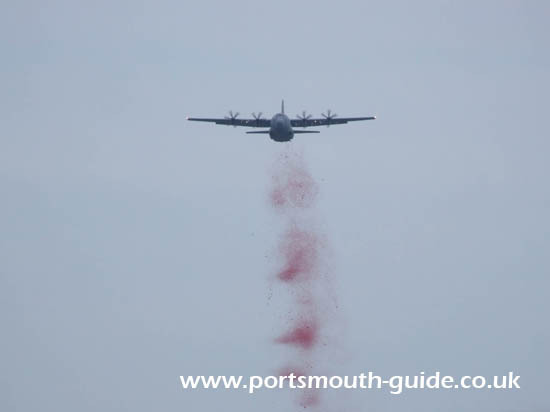 The Poppies were dropped from an RAF Hercules C-130. Ray Gelato and The Giants performed at the bandstand, along with the Memphis Bells and Katz Korner Lindy Hoppers. 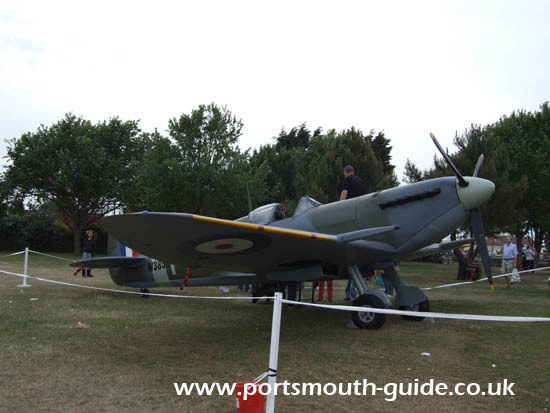 There were also many military vehicles as well as a full scale replica of a Supermarine Spitfire on Castle Field. The Solent Overlord Executive parked five authentic United States Army Jeeps alongside the D-Day Museum. The Jeeps included guns, rifles and a large amount of kit that would have been carried by the Jeeps 65 years ago. There was also the opportunity to plant commemorative flags between the Bandstand and Castle Field. Three hundred cyclist set off on a D-Day ride around Portsmouth, starting from the skate park on Southsea Seafront and made their way around the coastline of Portsmouth before returning to the Seafront. There was a recreation of a military village to be explored and the whole day proved a huge success with crowds of people flocking to the area. The Red Devils parachute display team dropped in onto Southsea Common to end the afternoon. The day proved a huge success and even though the weather was overcast crowds still flocked to the area. Earlier in the year on the 30th April 2009 Portsmouth welcomed the Queen and Duke of Edinburgh, for more details about the royal visit click here. For details about Portsmouth's D-Day 50 commemorations please click here.